Salmon in the oven is a super simple and healthy dish for everyone. 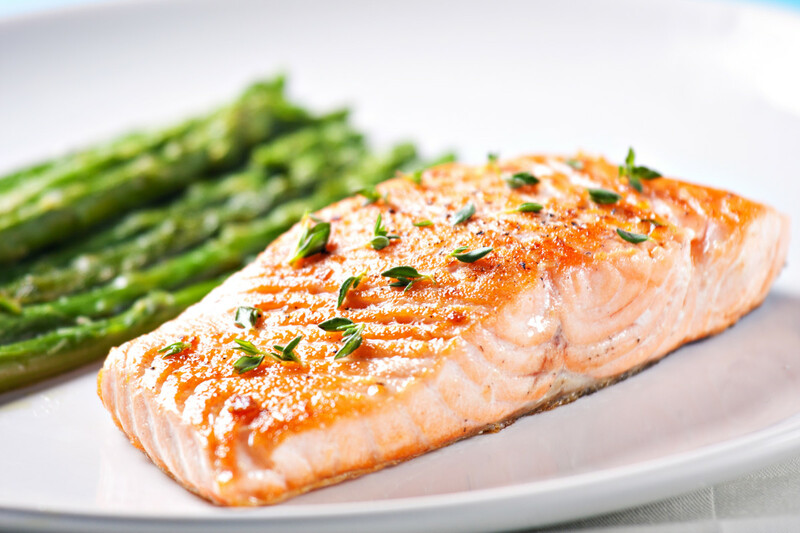 Moreover, this Healthy Oven-Roasted Salmon & Asparagus recipe isn’t only simple and fast, it’s as well a healthy lunch and dinner alternative, that will give you a nutrient dense meal, including healthy fat sources and a great number of proteins. Looking for more healthy and easy recipes? Then go to the recipe category or download the app! 1. Coat asparagus in 1/2 tsp. olive oil and sprinkle with a pinch of sea salt and cracked black pepper. 2. Bake at 425 degrees F until crisp (tossing occasionally) but still firm, about 7-10. 3. Coat salmon with 1/4 tsp. olive oil; add salt and pepper to taste (1/8 tsp. each). 4. Bake at 425 degrees F until done, about 4-6 minutes. 5. Serve your Oven-roasted Salmon & Asparagus with brown rice and drizzle with lemon. Looking for more healthy and easy recipes? Then go to the recipe category or download the app!